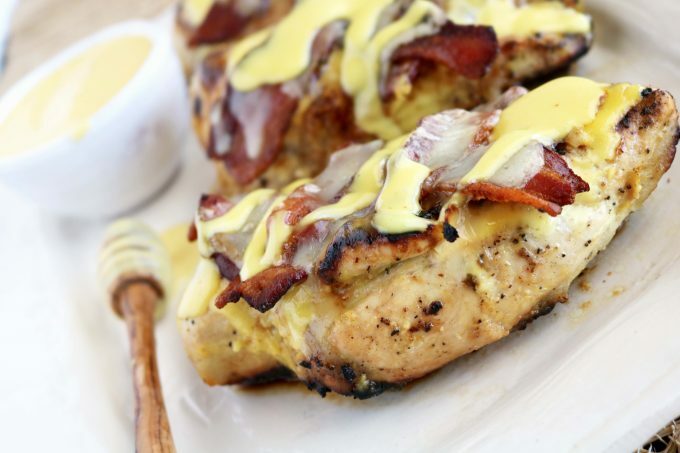 A recipe for bacon and cheese smothered chicken with an easy, homemade honey mustard sauce. If you cook chicken breasts just right, there is absolutely nothing wrong with eating one of those naked little birdies all on its own. But, we could all use a change of pace every now and again, and treating both ourselves, and the rest of the family to a dinnertime upgrade is in order. And believe me when I say, this honey mustard loaded chicken is one heck of a promotion. 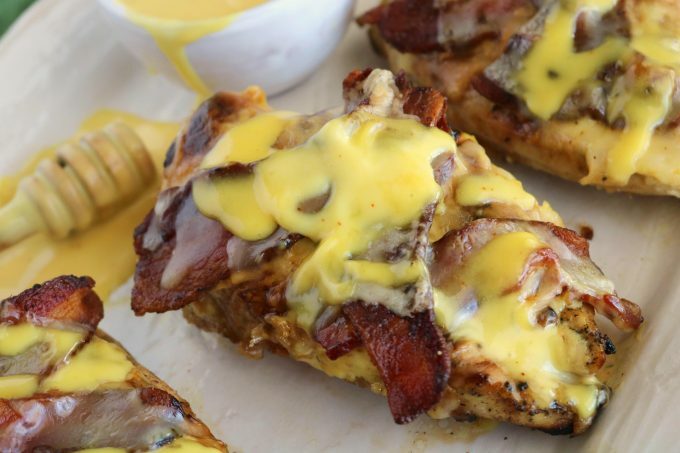 Cause, c’mon: Who doesn’t love bacon and cheese topped chicken? No one. That’s who. 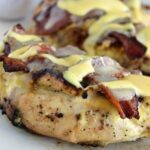 It’s chicken breasts smothered in a creamy honey mustard sauce, topped with thick-cut slices of crunchy bacon and oozing with melty Monterey Jack cheese. It’s an explosion of flavor, and you might find yourself having trouble going back to the days of plain Jane, baked chicken breasts after consuming this rendition of loaded chicken. It may be hard to tell whether the real star of the show here is the vibrantly flavorful chicken breasts, or the honey mustard. Personally, I love honey mustard, and I’ll be the first to admit I completely abuse it as a dipping sauce. 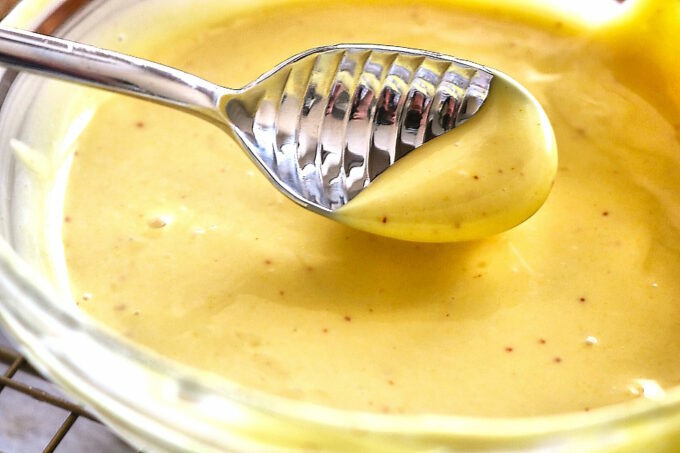 However, luckily this obsession has worked out in both of our favors, as it ultimately led to one of the greatest and easiest homemade honey mustard sauce recipes. All you need is a little mayonnaise, yellow mustard and, of course, some honey. Mix it all together, and bing-bang-boom, you’re done! And yes, it really is that simple. The chicken would be total satisfaction all on its own, as it is made tender and exceptionally flavorful thanks to an easy yellow mustard marinade, but I promised a dinnertime upgrade, and a dinnertime upgrade you shall get. You could either whip up the marinade the night before you intend to bake the chicken or in the morning, before you and the family head on out the door for the day. After the marinade has worked it’s magic, the chicken endures another flavor bomb in the form of bacon. Like I said before: Upgrade. Thick-cut strips of bacon are pan-fried, and once those beauties come out, the chicken goes in. The chicken is then dowsed with a helping of honey mustard, and topped with all that porky goodness and a generous pinch of Monterey Jack cheese. The whole ensemble is shipped off to the oven to finish cooking, and once the chicken is cooked through and the cheese has transformed into melty perfection, one might be faced with a choice: Eat it right outta the oven…or be extravagantly decadent, and hit it with one more drizzle of perfect honey mustard sauce. This recipe is the ideal combination of savory-sweet, anything but boring and an excellent change of pace for those chicken breasts you’re always scooping up at the grocery store. 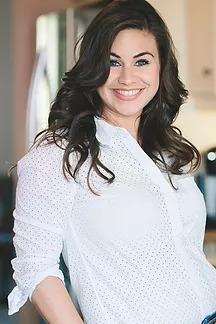 Get your honey-do’s ready and prepare a chore-list for the children, ’cause your family is about to owe you big for all the goodness you’re about to lay upon them. Enjoy this fully loaded rendition of honey mustard chicken! To make the marinade, in a bowl, combine mustard, honey, salt, and pepper. Slowly drizzle in the canola oil, whisking all the while. Set aside. Pat the chicken breast dry and add to a zip top, plastic bag. Pour the marinade over the chicken, massage briefly, remove as much air as possible and seal the bag. Transfer the marinade to the refrigerator and allow to set for at least 4 hours, or up to overnight. Set out chicken out at room temperature 30 minutes prior to cooking, and have ready a greased casserole dish. Have ready a large skillet over medium-high heat and plate lined with a paper towel. Cut the bacon in half crosswise, and place in the skillet. Cook for 5-7 minutes until browned and crispy, turning the strips half way through the cooking process. Transfer bacon to the plate. Turn off the heat, remove the grease from the pan and wipe the pan clean. Using a paper towel, wipe the majority of the marinade off of the chicken breasts and pat dry, leaving behind only a small trace of the marinade. Drizzle the chicken with 1 tablespoon of canola oil and sprinkle with TAK seasoning. Rub to adhere. Add remaining 2 tablespoons of canola oil to a large skillet over medium heat, and allow to come to temperature. Add the chicken and sear for 2 minutes, turn and sear on the other side for 2 minutes more. Do not overcrowd the pan, and sear the chicken in batches if necessary. Transfer to the prepared casserole dish. Top each breast with a generous spoonful of honey mustard sauce, bacon strips and a large pinch of Monterey Jack cheese. Cover with aluminum foil and bake 25-30 minutes, or until cooked through. For larger chicken breasts, bake closer to 30 minutes. Remove from the oven, drizzle with more honey mustard (if desired), serve and enjoy. Be sure to add 4 hours to your prep time if marinating the chicken!